12 Days of Christmas Competition - Day 7. We are now half way through my 12 Days of Christmas Competitions but there's still plenty of time to enter them all! 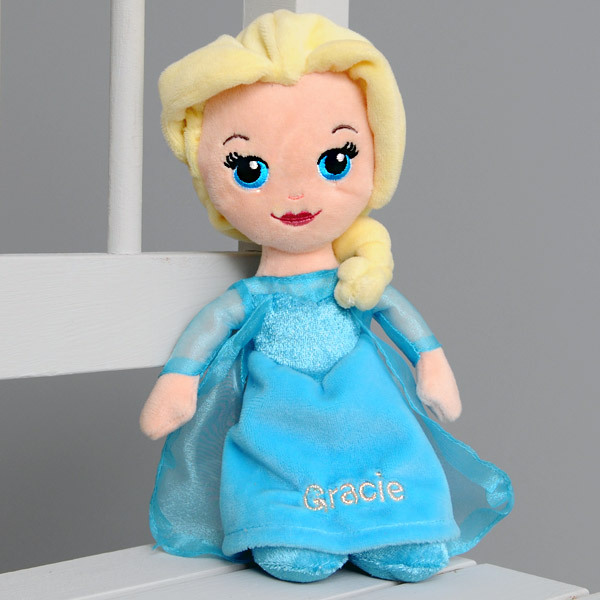 Today's prize is a personalised Disney Princess Doll from I Just Love It. As mentioned in so many of my posts in the past I'm a really big fan of personalised gifts and I think these dolls are amongst my favourite. There are multiple Disney princesses to chose from over on the website; Elsa, Ana, Cinderella, Belle and Snow White, all of which can be personalised with a name of your choice. They cost just £22.99 and I think one of these dolls would make such a lovely Christmas present this year. Think my niece would like the Cinderella doll. I would choose Airel for my neice because she is in love with Little Mermaid! I would have to choose Elsa, she is my daughter's favorite princess. My niece is absolutely obsessed with 'Belle' from Beauty & The Beast - she can't wait to see Emma Watson star as her in the live action remake. Elsa would be the only acceptable choice at the moment. Thank you for the amazing giveaways. My niece would make me pick belle haha! I would choose Sofia for my friends little girl Sophia. Cinderelly! My eldest, Hudson Rose, often sighs and jokes that she's Cinderella when we ask her to tidy her toys away - this would be the perfect doll for her, too funny! Unfortunately there isn't princess Jasmine for my daughter Jasmine... so I would probably go for Elsa instead. My daughter's favourite Disney princess is Merida from Brave. I would pick the Snow White doll. it would be Belle for my little grand daughter Alexis,as she loves Beauty and the Beast. Current favourites are BElle and merida but that might change in the morning! I would choose Snow White! The Snow White one for my Granddaughter. I think i would need to pick Snow White as she is a huge favourite in my home. I think my daughter would want Anna. It's a shame Rapunzel isn't there. I would choose Belle for my niece. I would choose Elsa, as my daughter loves her. She thinks they are twins! I would pick Elsa but wish they also did Rapunzel as she's a real favourite here - maybe for future they might? I think my little cousin would love Elsa! I'd love a Belle for my Beastie. She is getting the tea cart for Xmas so this would be the perfect accompaniment! I would choose Elsa for my little granddaughter as she is a great favourite of hers. I would choose Elsa please :) Just love these!